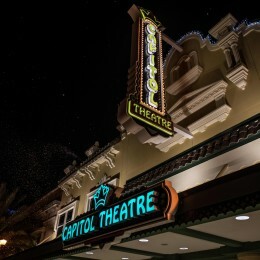 Through a partnership between the City of Clearwater, Ruth Eckerd Hall, Inc. and the Capitol Theatre, the Capitol Theatre re-opened this past month after undergoing a $9 million renovation. one of Clearwater’s most treasured landmarks. 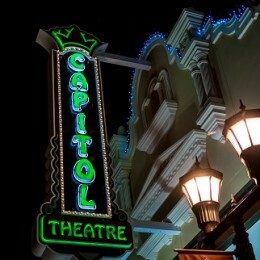 Through a partnership between the City of Clearwater, Ruth Eckerd Hall, Inc. and the Capitol Theatre, the Capitol Theatre re-opened this past month after undergoing a $9 million renovation. The renovation, completed by Creative Contractors Inc., included the expansion to 737 seats, four private loge boxes, several concessions stands, a lobby expansion, an outdoor balcony to wrap around the building, a VIP room, and rooftop terrace. 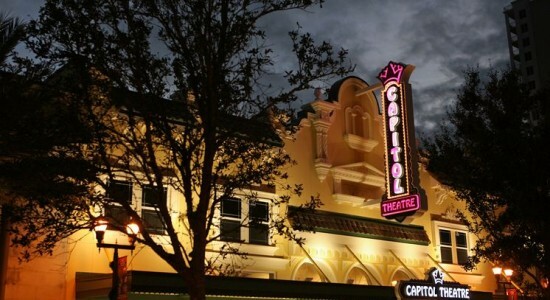 Capitol Theatre will become a venue at which Ruth Eckerd Hall will present all genres of live entertainment, including jazz, classical artists, pop music acts, film, dance and other diverse national, regional and local acts. 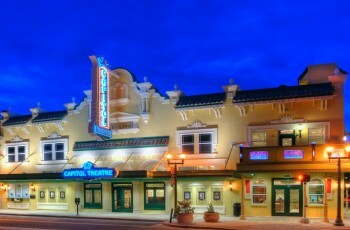 Creative Sign Designs was happy to play a part in this renovation of one of Clearwater’s most treasured landmarks. 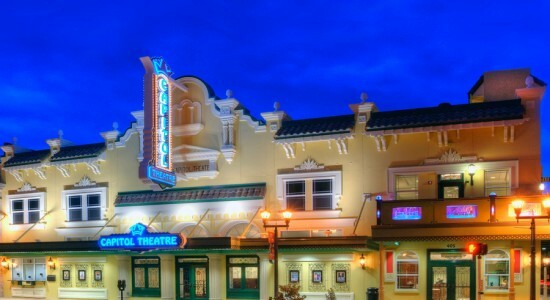 Creative Sign Designs provided design, fabrication, project management and installation of all new interior and exterior signage for the theatre. 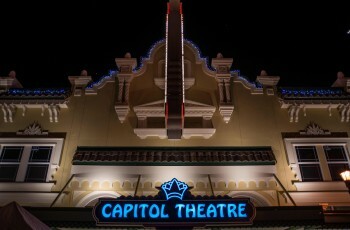 The exterior signage includes a 20-foot-tall illuminated blade sign. The sign cabinet is fabricated from aluminum, high density urethane and acrylics, and is affixed to the front of the building using steel support arms. 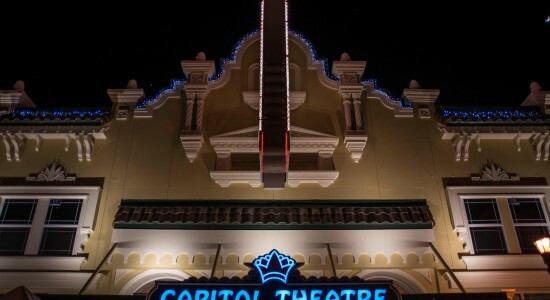 The crown and theatre decorations are aluminum constructed reverse channel and are back lit using RGB LEDs. 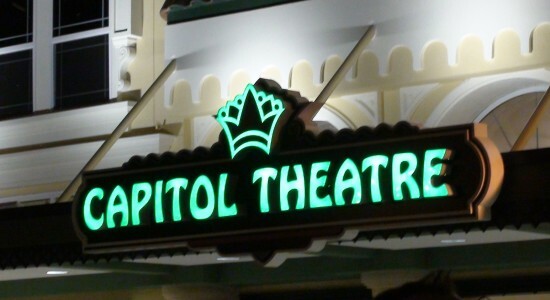 The custom “CAPITOL” channel letters are illuminated with incandescent LED bulbs and have an exposed neon border. But the lights aren’t done yet! To top it all off, the sign has an LED bulb channel border that is set to have a 4 part flash-chase effect. 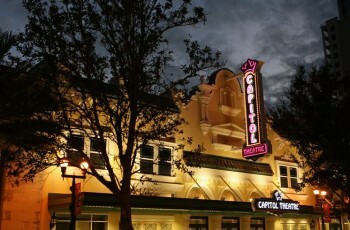 The decorative, green scroll accents were chosen to compliment the theatre’s existing architectural features. 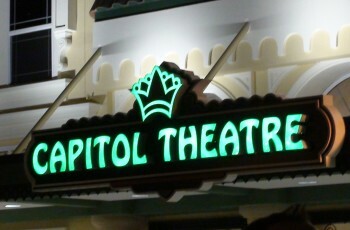 Below the blade sign is a custom fabricated façade sign that is also back lit with RGB LEDs. The best part about incorporating the RGB LEDs into the sign design is the multi-color feature and ability to synchronize their effects. Creative Sign Designs also provided the interior signage. The interior signs are custom, cast resin molded frames with applied tactile inserts and custom logo embellishment. Pictogram pictures were altered to include theatre symbols. This helped bring the project into ADA compliance. The theatre seat end caps are made from engrave-able Rowmark and coated with high gloss polyurethane.